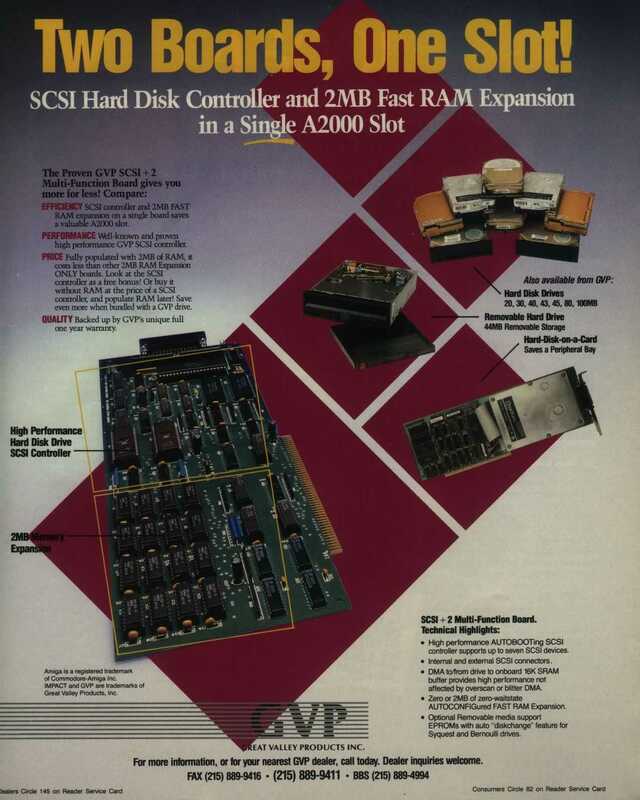 This board family is the original GVP Impact (Series I) disk controller and RAM expansion technology for the Amiga 2000. It is based upon a 33C93/33C93A 8-bit SCSI controller that can transfer data to/from an onboard 16K SRAM buffer, which is then serviced by the CPU. The board has an internal 50-pin SCSI header and an external DB25 interface. SCSI bus termination resistor packs are soldered in. There were 2 models of this product that supported different memory configurations. The first revision supported 0M/1M/2M configuration with 8 or 16 pieces of 256x4 DIP RAM chips. The second revision only supported 0M/2M configuration with 16 pieces of 1Mx1 DIP RAM chips. Memory chips should be 100ns or faster. The first revision (256x4) had a PAL update that was necessary to correct an AutoConfig bug with the 1MB memory setting. GVP 1.0 (2), 2.0 (2), and FastROM 3.x (1) AutoBoot ROM(s) are supported under Kickstart 1.3 and higher. There are jumpers for Autoboot ROM disable (remove), RAM settings, and for the HDD LED connector. All others jumpers are reserved. This board was eventually superseded by the GVP Impact SCSI+RAM 8/0 product that used standard 30-pin SIMM modules in pairs. Picture Note: This is the later revision (1Mx1 DRAM) of the board.